Again, there was exactly the same crunch to these snacks as the others we have tried - You will not find us describing Pringles as Chips or Crisps on these pages, however the lobbyists and courts may describe them. The reconstituted nature of the snack featured a superb initial crunch, but they quickly turned mushy. If you have read other Chips & Crisps Pringles reviews, you will have read similar descriptions of both the Texture and the Crunch - they all look virtually the same. These snacks are very easy to describe. They are famously saddle shaped. The surface was bumpy but smooth. The colour was a very pale yellow that, if it were paint, would be described as 'White, with a hint of yellow.' There was also a lot of pale powdery seasoning mixed in with some orange colored seasoning. A Nose Plunge Test revealed a potatoey and somewhat warm and inviting Barbecue aroma. The taste was really quite sweet. There was also a very small after-burn, which was quite surprising. 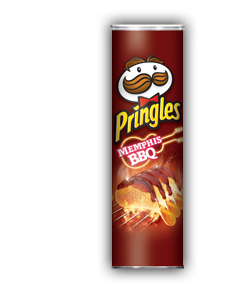 There was also a Smoky Barbecue flavor running through the combination, that was enjoyable and moreish.